There are three basic ways of recording guitar: miking up an amp, use a digital amp modeller or direct input. The first two record a “wet” signal, with effects like distortion already present in the sound. The third records a “dry” signal with the signal unmodified as it comes from the guitar output jack. It’s prone to huge differences when you record in multiple sessions. The microphone has to be placed exactly in the same spot each time each session, you have to be able to crank up the volume to get the right amount of distortion. The signal is recorded wet, so there are limitations to what you can change after the recording is made. Say you want to switch amp or cabinet, then you have to re-record. The sound is recorded using a microphone placed in a very unnatural listening location – at just inches from the speaker. This produces a near-field recording, quite unlike what you would hear from the amp played in a room (for more on near-field vs far-field, read WDYRSLA). What you need: an amp, a microphone (like an SM 57), a soundcard (preferably low latency, USB or FireWire), DAW/recording software. A very common alternative to the analog miking of an amp in method one above, especially for home guitarists with limited space and limited opportunities to play at loud volumes, is to use a digital amp modeller. What it does is that it digitally simulates an amplifier, a cabinet and usually a gazillion different stomp boxes. The amp modeller is completely unaffected by volume, it always delivers the same level of distortion etc. You can save the whole signal chain with all settings (on amps, cabs, mics, pedals) into complete presets or “patches”. Recording with an amp modeller is really easy, since most of them come with built-in USB soundcards. Just hook up your modeller to your computer, start your favorite DAW (or even just a simple sound editor) and record. 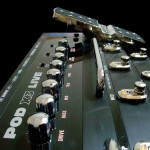 Line6 PODs are probably the most popular amp modellers, like my trusty POD X3 Live and the newest generation POD HD 500. Boss also has a very popular line called GT (GT-8, GT-10) and there are a bunch of iPhone-based amp sims (like AmpKit, Amplitube and JamUp). A number of professional studio-grade units have also seen daylight in recent years, most notably Fractal Audio’s Axe Fx and Axe Fx II and most recently the Kemper Profiling Amp. The drawback with amp modellers is that they don’t sound very good – or at least that used to be case. With the old PODs you could almost always tell they weren’t a real amp, especially at high gain. Artifacts and pick attacks reduced to pure white noise were sure telltales. However, with in the newest generation (especially with Axe Fx) I see self-proclaimed experts on forums fail A/B tests between amp sims and real amps all the time. Another drawback with recording the wet signal from an amp sim is the same as recording wet from a real amp – you can’t redo the settings once it’s recorded. What you need: an amp modeller with USB connection, speakers/monitors/headphones, DAW/recording software. Direct Input, aka DI, means recording the dry signal directly from the guitar with no amplification (except a preamp to bring it up to line level – if you just connect your guitar to the soundcard the signal is too weak). It’s usually extremely difficult to play properly when you’re hearing just the dry signal, so you want to hear a wet signal reasonably close to your expected end result (see below). One way of doing this is using an amp sim (a virtual amp modeller) that lets you monitor the wet signal in real time but that saves the dry signal. There are lots of popular alternatives, like Guitar Rig, Amplitube and POD Farm, the software version of what’s running in the Line6 PODs. Another way of accomplishing dry recording with wet monitoring is using a Direct Input box. A DI-box splits the signal and sends it dry to the computer for recording and simultaneously to a regular amp for monitoring. The final recorded dry signal isn’t much good on its own, so you have to apply an amp sim to it or send it through a real amp and re-record it wet. What you need: An amp, a microphone (like an SM 57), a soundcard (preferably low latency, USB or FireWire), a DI box, DAW/recording software. The fourth way of recording which is really common is a combination of 3 and either 1 or 2. Simply put, you record the wet signal that you use for monitoring at the same time as the dry signal. This way you have a ready-to-use track but also the option to go back to re-amp later. 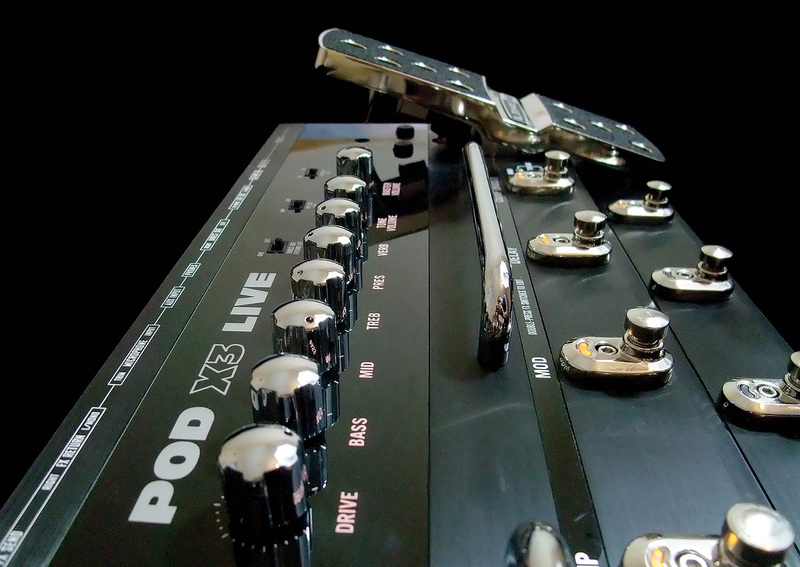 My POD X3 Live is actually quite advanced – it has a multi-channel USB interface which allows wet and dry recording at the same to from just one device. So I use sometimes use it to record tracks. More and more I’ve started using LePous great Rectifier amp sim, so I more and more just keep the dry tracks and run them through that. What I’ve found, a bit to my surprise, is that the X3 doesn’t deliver such a great dry signal. Even more incredibly, AmpKit on the iPhone, which always records both wet and dry, delivers really good dry recordings. This is probably in part thanks to Apogee’s great Jam interface for the phone. So I use that more and more for my recordings.